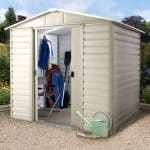 This premium bicycle store shed will give you extra security as it is constructed from galvanised steel with a padlock to keep thieves away. Not only for bikes, it is ideal for light gardening equipment and tools. 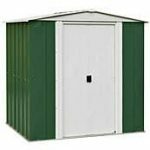 A patented design, the Trimetals Metal Bike Shed will keep your bikes safe, secure, protected from weather and it is maintenance free and comes with a 25 year panel guarantee. 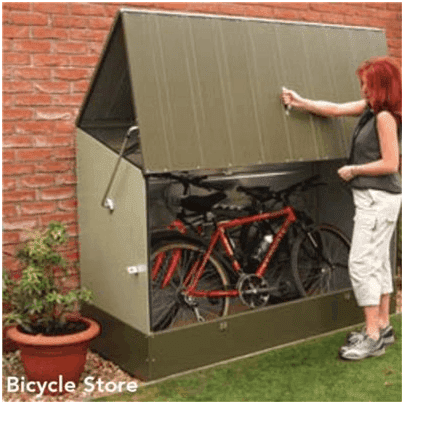 Mountain Biking UK rated this storage 9 out of 10 so it’s a must for any cycling enthusiast or just to keep the kids’ bicycles and scooters clean and dry. I bought the Trimetals Metal Bike Shed because I love to cycle cross-country while I’m here and I have ridiculously expensive bikes to fuel my hobby; but I also travel a lot. 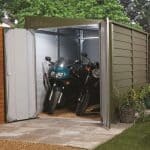 I live in a very rainy town and I need a way to protect my bikes from the weather while storing them when I’m away. I can’t keep them in the garage because my wife hates them and will throw them out first chance she gets. 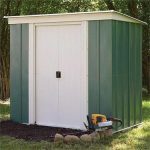 The Trimetals Bike Shed, therefore, is just perfect, because it can easily be installed anywhere, and has the right amount of storage space for all three of my bikes; it’s also very sturdy and weatherproof, and I can rest easy knowing that no matter what disaster occurs at home, the bikes will stay safe. Sometimes I am gone for months on end; the Trimetals shed ensures that my bikes stay perfect and are waiting for me when I get back. 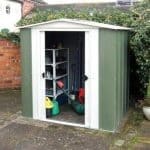 I’d recommend this shed to any cycle enthusiast looking for a convenient, long-lasting, and affordable storage solution.